I have used this image of the tree and its roots system sinking deep into the nourishing soil to discuss finding balance in life. And it is an appropriate image to use again in our current discussion of words like should, shouldn’t, must, ought — the kind of words that may get us to accomplish something, but in the long run are ineffective and disruptive. Using our tree analogy, should and other such words are like artificial fertilizers applied to the surface of the soil. They cause activity in the roots, but can’t go deep enough to strengthen and balance the tree. The roots stay close to the surface, causing instability. To be effective the fertilizer has to be applied again and again. It’s an artificial construct, constantly activating us to be ‘our best.’ That ‘best’ is determined by the internalized gardener (the set of ‘should’ messages we have internalized from external sources) who has certain preferences, like having us at the perfect peak of bloom, never dormant. This goes against nature, the cyclical quality of life itself. When we force bloom ourselves through the repeated application of this ‘should’ fertilizer, we get stressed and out of touch with our own natural rhythms. So where did this internalized gardener come from? We learned all the inner ‘should’ gardening techniques we use from our parents, teachers, schoolmates, friends and the culture we live in, all of whom learned the same ‘should’ talk as part of the cultural norms. As there are cultural shifts in the norms over time, the shoulds just change the formula on the fertilizer, so one generation may have a different set of ‘shoulds’ to deal with. And of course the ‘shoulds’ have variations in different parts of the world. To continue our gardening analogy, think about how trees grow in the forest without a gardener to ‘nourish’ them. For the most part they do just fine, don’t they? And we, without all the ‘should’ fertilizer, are able to do ‘our best’ without relying on these internalized external messages constantly pushing us to do so. If this sounds scary, it’s only because we sometimes don’t know who we are without these messages we have relied on so heavily. But this is the gift of insight practice, to explore who we are when we let go of all the ‘extra’ stuff, including the ‘should’ messages that bombard us and make it difficult to simply be. I remember at one point in my life feeling so reliant on the should messages to get me through my day that I had no sense at all of who I was. I told a work colleague that I felt ‘totally separate from myself.’ I was lost in the shuffle of trying to live by ‘should’ messages, trying to be what I thought others expected me to be. I needed most desperately to be the best I could be in order not to disappear off the face of the earth. Or so it seemed. If this resonates in any way, please take more time for yourself NOW, not at some lovely later date when things are less demanding. It may seem like the only thing that is holding you up is the long list of ‘should’ messages, but in fact there is a powerful support system already in place if you just take the time for yourself in a quiet intentional way to notice. This is where the real value of going on a longer retreat comes in. In a pared down setting with minimal instruction and lots of space and time to be in silence, we have an amazing opportunity to notice all the clatter. If we get caught up in fighting the clatter, we just make more clatter. But if we simply notice it, observing its ways, giving it a lot of space to show itself fully and our awareness space to hold it without getting tangled up in it, then we gain great insight. The ‘shoulds’ show up and reveal themselves as voices from the past perhaps, voices we can now recognize. We can question the veracity of their statements because we are adults now and can be more discerning. We can recognize the fear in which these ‘should’ messages are steeped. Patiently and respectfully, we can have an inner dialogue and address the fears skillfully. This is the great benefit of sustained and intensive meditation practice. In our tree analogy, we can see that the constant shallow application of artificial fertilizer stunts the roots, keeping them close to the surface, unable to withstand a strong wind. Just so, we are unable to withstand the strong winds of causes and conditions — loss of love, position, power, possessions, health, etc. — if our roots are not deeply rooted in rich soil and the underlying aquifer of understanding our infinite connection to all that is. 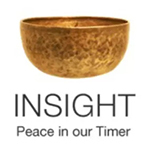 So as part of your meditation, after you have developed a centering, focused awareness practice, allow time for insights to expose the ‘should’ patterns that rise up in your thoughts. As we are able to notice the ‘shoulds,’ their hold on us lessens. We see how the sense of deeply-rooted connection inspires naturally arising loving-kindness and compassion so that we don’t need ‘should’ to know how to behave. If we sense our connection, we will be respectful toward ourselves, toward the earth and all life. Out of that connected respect comes a collaborative creative way of being in the world that no ‘should’ could ever force. We will still be imperfect beings. ‘Perfect’ is a should-based concept that has no reality in nature. We will still have challenges and misunderstandings, but we will have the deep roots to keep us grounded, and that makes all the difference in the world. This entry was posted in http://schemas.google.com/blogger/2008/kind#post, people pleasing, should, tree analogy on May 29, 2012 by Stephanie Noble. This is beautiful and exactly what I needed to hear. I think what you are doing is awesome and I can't wait to read your other posts! I found you through LinkedIn and am now a new follower. I'm excited to get your new posts in my Google reader! I would love it if you found the time to venture over to my blog, when you get a chance. I am a newbie and could use as much feedback as I can get!